The head of the progressive minority Justice Party has proposed a parliamentary resolution to implement the Panmunjeom Declaration. 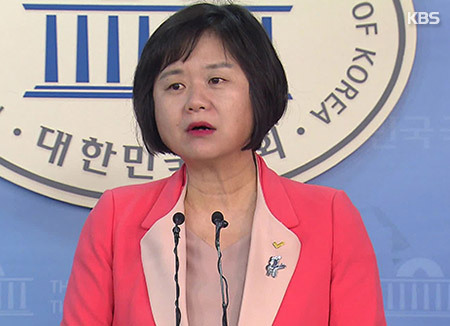 Chairwoman Lee Jeong-mi made the proposal during a press conference on Wednesday, saying now is the time for the National Assembly to play its role for peace on the Korean Peninsula. Lee emphasized a thorough implementation of the declaration made during the landmark inter-Korean summit on Friday, saying the agreement should not follow in the footstep of the other inter-Korean declarations made during the two previous inter-Korean summits. She said that if a swift parliamentary ratification of the declaration is not easy, the parliament should pass a resolution first pledging to implement it entirely. She also proposed that the parliaments of the two Koreas pass such a resolution together. She said it will send a very significant message to the world, asking the rival parties in the South to join the efforts.